An elderly hotel owner relates the story of how he came into possession of the title establishment. In the fictional Central European Republic of Zubrowka, an author (Wilkinson) begins to narrate the story of his book, 'The Grand Budapest Hotel'. The tale begins in 1968 with a guest (Law) at the hotel encountering the enigmatic owner of the establishment, Zero Moustafa (Abraham). Over dinner, Zero tells his guest the tale of how he joined the hotel's staff as a young man (Revolori) and was taken under the wing of the head concierge, the roguish and charming Gustave H (Fiennes). Wes Anderson caught my attention with 1998's Rushmore, a highly original coming of age tale. Sadly, he lost it immediately with his pretentious 2001 follow-up, The Royal Tenenbaums, and following on with highly irritating fare like The Life Aquatic and The Darjeeling Limited, Anderson took his place alongside the Coen Brothers and Tim Burton as a film-maker whose approach I just couldn't get on board with. I've always admired Anderson's films on a purely visual level but to me his work has always felt like a beautifully crafted, multi-tiered cake whose creator won't allow you to have a taste. 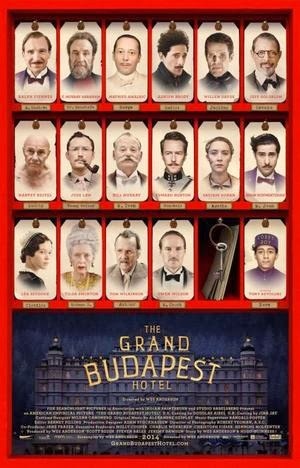 With The Grand Budapest Hotel, Anderson finally offers us a slice, and quite a confection it is, containing enough life, warmth and joviality in its 100 minutes to make up for the cold artificiality of his previous decade's work. The marketing may fool you into mistaking the movie for an ensemble piece, given the enormous roster of talent at play here. Anderson's ensemble approach was a large factor in turning me off his previous films and his characters have always felt more like caricatures because of this. I've often suspected Anderson cares more about his characters' outfits and facial hair than their behavior or personalities. Thankfully, his latest film is largely a one man show, that man being Fiennes, finally delivering on the promise he showed two decades ago when he exploded onto the scene as Amon Goeth in Schindler's List. His performance here is mesmeric and feels like a genuine product of the period being referenced, unlike say, George Clooney in the similarly themed but inferior O Brother Where Art Thou, a movie which, like this, owes a large debt to Preston Sturges. Anderson's film is a callback to the golden age of Hollywood comedy: the thirties; in particular the films of The Marx Brothers, Preston Sturges and Andrew L Stone. My biggest complaint about modern cinema, and comedy in particular, is its glacial pacing. This film moves like a bobsleigh; even its protagonists seem out of breath as they struggle to keep up with both the quickfire dialogue and Anderson's roaming camera. The latter creates the feeling for the audience of being strapped into a wheelchair while a maniac takes you on a whirlwind tour of your environs. The phrase "rollercoaster ride" is often used to describe a thrilling adventure movie. The Grand Budapest Hotel is no mere switchback, it's an entire fairground. I doubt we'll see a more visually impressive film in 2014. Adam Stockhausen's production design and Bob Yeoman's cinematography combine to create the illusion that we're not looking at a flat screen but rather gazing into a cube. If you thought the 3D of Gravity was immersive, wait 'til you see the 2D of The Grand Budapest Hotel.